Kick back, grab your favorite frosty beverage and sing "We're Gonna Win Twins" at your very own pub! 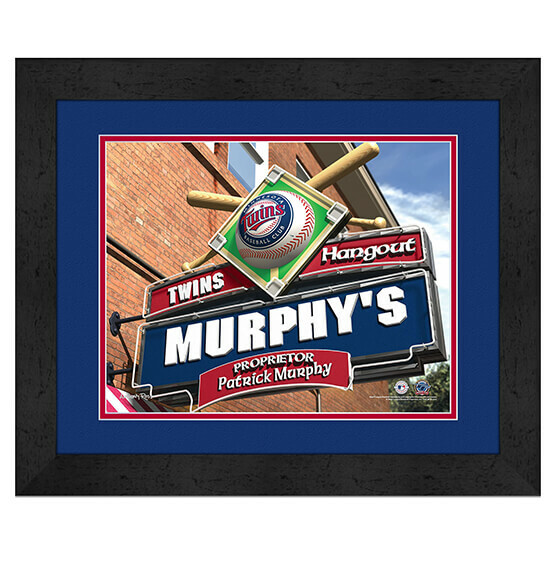 Our Personalized Minnesota Twins MLB Pub Sign Framed Print is customizable with your specified names. This high-quality, made-to-order print is safely positioned behind quality glass for a long-lasting complement to your Twins fan zone. Have a cold one and discuss the best of the Minnesota Twins' roster like Kirby Puckett, Kent Hrbek and Harmon Killebrew with the other Twinkies fans. This custom, generously sized framed print will cement your status as the franchise's number one fan.